Just as we have seen advertisements in the newspaper, television, and blogs, Yahoo! is taking is a step further – to advertise in PDFs. Yahoo! have successfully negotiated a deal to start running advertisement campaigns in Adobe’s most popular PDF document reading format. This deal will allow publishers to make money by inserting relevant advertisements linked to the content of a PDF document in a panel at the side of the page. Fortunately, the advertisements will not be seen if the user decides to print out the document. This is part of Yahoo!’s expansion plans into the untapped markets such as the auction site Ebay, and the cable TV group Comcast. 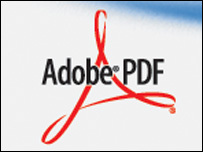 Adobe announced that this is the first time it allows the insertion of dynamic advertising into its PDF files.